Sorry... the 2017 Honda Accord is no longer being sold as new. Instead, take the first step to a great deal on 2019 Honda Accord with a free price quote! 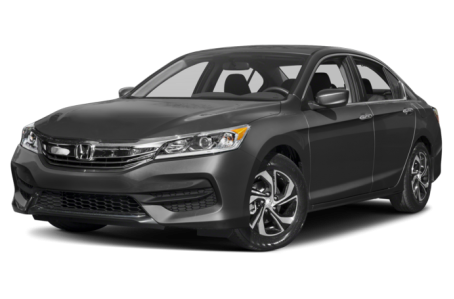 The 2017 Honda Accord is a popular midsize family car that comes as a sedan or coupe. It competes with the Ford Fusion, Toyota Camry, and Mazda Mazda5. A more fuel efficient hybrid version of the Accord sedan makes its return after a year hiatus. The Accord Hybrid will be covered in a separate overview. The sedan version has five available trims: the LX, Sport, Sport Special Edition, EX, and EX-L. The coupe version has five available trims as well: the LX-S, EX, EX-L, EX-L V-6, and Touring. Last year, the Accord sedan underwent a mid-cycle refresh, which included a chrome shield on the front grille, a sporty fascia, and chiseled front- and rear-ends. The new Sport Special Edition trim comes with larger 19-inch wheels, LED fog lights, and special badging. The coupe version has a more aggressive appearance than its sedan counterpart. It has larger, dynamic air scoops at the front- and rear-ends. Available features include a sport grille, underbody kit, heated side mirrors, turn signal indicator mirrors, a rear spoiler, and a dual-pipe exhaust system. The Accord is powered by a standard 185-hp, 2.4-liter 4-cylinder engine mated to a 6-speed manual transmission or a continuously variable automatic transmission (CVT). The Sport and Sport Special Edition trims are tuned to make 189-hp with the same engine and the CVT. A powerful 278-hp, 3.5-liter V-6 mated to a 6-speed automatic transmission is also available for the coupe version. Fuel economy for the regular 4-cylinder/manual model is an EPA-estimated 23/32 mpg city/highway. It increases to a 27/36 mpg rating for the 4-cylinder/CVT model, but slightly dips to a 26/34 mpg rating for the Sport and Sport Special Edition trims. The V-6/automatic model earned a 21/33 mpg rating, while the V-6/manual model has a rating of 18/28 mpg. Inside, the Accord has a standard black cloth interior or available black leather-trim seating. The new Sport Special Edition comes with unique red-stitched, black leather seating. The center console features a standard audio system, which includes CD/MP3 playback, Bluetooth connectivity for phone and audio, and a USB port. It can be upgraded to an advanced multimedia system that includes a 7-inch touchscreen, an integrated navigation system, Apple CarPlay/Android Auto compatibility, a satellite radio, and a premium audio system. Standard features include a dual-zone automatic climate control, cruise control, and power windows/locks. Power/heated front seats, heated rear seats, split-folding rear seats, push-button start, an automatic dimming rearview mirror, and aluminum pedals are optional. The Accord earned a full 5-star overall crash test safety rating from the National Highway Traffic Safety Administration (NHTSA). Standard safety features include a backup camera and a tire pressure monitoring system. Available features include lane keep assist, adaptive cruise control, a pre-collision mitigation system, and automatic emergency braking. 290 of 297 (97%) consumers said they would recommend this vehicle to a friend.